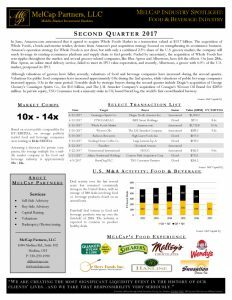 Our research in our food M&A quarterly newsletter details how the transaction has affected other valuations of food and beverage companies. Download your free copy of our newsletter to learn more! We'll also sign you up for future updates. Learn more about how recent deals have impacted the food M&A industry and where we see the future of this industry heading. Download your free copy of our newsletter today!